Donald Macleod delves into Felix Mendelssohn’s popularity in London. In Composer of the Week, Donald Macleod journeys through the life of Felix Mendelssohn, exploring in particular a number of influences upon the composer’s works. 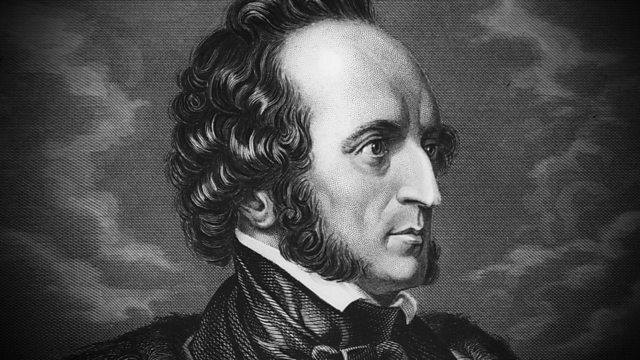 Mendelssohn was a leading figure of German music in his day, and became something of an international celebrity. He was at the very forefront of music making during the 1830s and 1840s, as a composer, conductor, pianist and organist. He began as a highly gifted and versatile prodigy, and rose to become one of Germany’s first rank composers of the early romantic period. He composed music in many genres including concertos, oratorios, symphonies, songs and chamber music. Amongst some of his most famous works, are the highly evocative and dramatic overture to A Midsummer Night’s Dream, and his mature and richly romantic Violin Concerto. Felix Mendelssohn made many visits to London during his lifetime. As his travels to the capital progressed, so did his ascending star and status with the British public. Initially he wasn’t recognised as a professional composer on these shores until a performance of his overture to A Midsummer Night’s Dream. After this point, commissions started to pour in. During his first few visits, Mendelssohn generally restricted his public appearances to benefit concerts, or concerts given by the Philharmonic Society. With his popularity growing he was soon giving impromptu performances on the organ at St Paul’s Cathedral, where people would flock to hear him play. London society idolised Mendelssohn, and the city became a testing ground for some of his new compositions including his Rondo Brillant. His popularity rose to such a pitch that he was invited to Buckingham Palace to socialise with Queen Victoria on a number of occasions. Performer: Ronald Brautigam. Orchestra: Amsterdam Sinfonietta. Conductor: Lev Markiz. Performer: Eugene Asti. Singer: Sophie Daneman. Performer: Eugene Asti. Singer: Stephen Loges. Singer: Simon Keenlyside. Singer: Rosemary Joshua. Singer: Dame Sarah Connolly. Singer: Robert Murray. Choir: Chór Filharmonii Narodowej. Ensemble: Gabrieli Consort. Ensemble: Gabrieli Players. Director: Paul McCreesh.